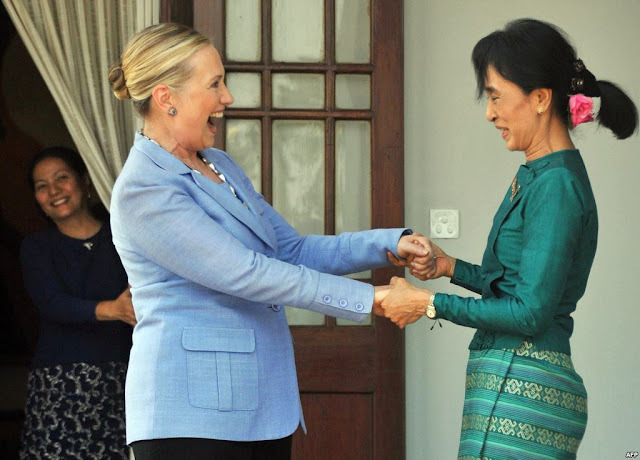 May 15, 2016 (Tony Cartalucci - NEO) - Myanmar's "de facto leader" Aung San Suu Kyi recently warned the United States to not refer to the Rohingya ethnic minority as "Rohingya," in an attempt to deny them the dignity and human rights she and her party posed as renowned defenders of. Image: Fake "monks" who constitute the violent street front that helped propel Suu Kyi into power, are also shamelessly and openly racist bigots bent on carrying out genocide against the nation's Rohingya population. For those critically examining and long-following political developments in Myanmar and their wider geopolitical implications for Southeast Asia, Asia, and the world, Aung San Suu Kyi and her "National League for Democracy" (NLD) political front, along with a vast array of Western-funded NGOs' turning against Myanmar's Rohingya population after predicating their ascent into power upon "human rights" and "democracy" is no surprise. However, it was warned before recent elections - hailed by the Western media as "historic" - that not only would Suu Kyi fail to deliver on the utopian promises her party represented, and not only would her coming to power begin a process of recolonization by the British Empire's successors in London and on Wall Street, but that it would also herald increasing persecution, violence, and eventually genocide against the Rohingya minority already long-targeted by Suu Kyi's staunchest supporters. 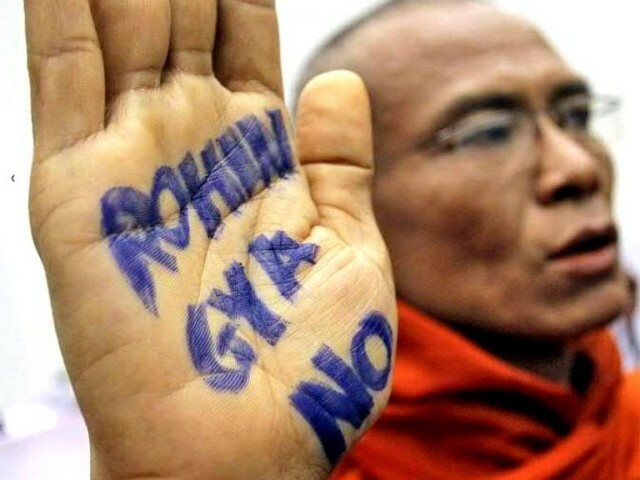 As early as March 2015 in a previous article titled, "Myanmar: Meet Aung San Suu Kyi's Saffron Mobs," the true nature of Suu Kyi's support base was revealed with the "saffron" robed monks often the centerpiece of Suu Kyi and the NLD's street demonstrations exposed as ultra-violent, genocidal, and very much Western-backed. More recently, as Suu Kyi assumed power by proxy through a hand-picked "president" Suu Kyi openly pledged to "rule above," it was warned that the stalwart support of Suu Kyi's "saffron" mobs would be rewarded by giving them an increasingly free hand to target and eliminate Myanmar's Rohingya people. With the diminished role of the military in government and Suu Kyi's self-serving and selective adherence to the rule of law, her supporters likely anticipate a free hand in actualizing their genocidal ambitions versus not only the Rohingya, but all of their political and sociocultural enemies. New York Times' screed, however, is predictably inaccurate. The "previous military-led one," had in fact, attempted to grant the Rohingya additional rights, including the right to vote, and only backed down as a matter of concession when confronted by Suu Kyi's violent street mobs. Image: Suu Kyi's stunning hypocrisy is no surprise to the US, her ultra-violent street mobs are in fact a creation and perpetuation of her own Western sponsors. The US backing such mobs in Myanmar should come as no surprise, as it concurrently props up Al Qaeda in Syria and Libya, literal Nazis in Ukraine, and violent "red" terrorists in Thailand. Wirathu, also known as the "Buddhist Bin Laden," led Aung San Suu Kyi's "Saffron Revolution" in 2007 and his followers regularly fill the ranks of street mobs organized in support of her NLD party to this day. As the US condemns the government in Damascus for using armed force against torrents of foreign-backed terrorists spilling over its borders - essentially an invasion - it is silent, even apologetic in regards to Suu Kyi's serial and increasingly egregious offenses against ethnic minorities in Myanmar. The US is also silent in regards to Suu Kyi's illegal seizure of power, having openly declared herself "above" the nation's president, and with the New York Times itself describing her as "the country’s de facto leader." The explanation for this is well-documented and straight forward. Suu Kyi, her political front, and the numerous NGOs helping to underpin both, are the financial, political, and geostrategic creations and perpetuations of the US and British governments, a decades-long project of undermining and overthrowing Myanmar's political order, and replacing it with a client regime more "friendly" to special interests in London and on Wall Street. 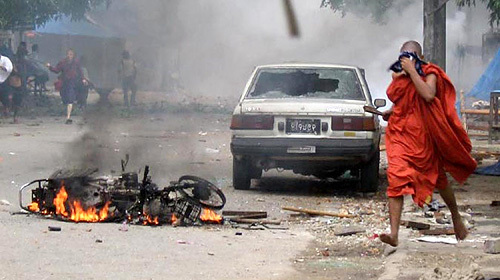 Image: Suu Kyi's "saffron" street mobs regularly torch Rohingya communities and refugee camps, often hacking to death with machetes victims as they flee their burning property. Notions of "democracy" and "human rights" are now clearly facades this agenda was couched behind, cynically used against the previous military-led government to protect the rise of the West's proxies, and then conveniently discarded once those proxies came to power. Documentation and reporting on violations of human rights by Suu Kyi's political front and its various supporters across the country will continue, quietly, and only be sensationalized if and when Suu Kyi and the NLD misstep regarding Western interests in the Southeast Asian state. Currently, anti-Chinese protests are erupting at a mine operated in cooperation with Chinese business interests. Suu Kyi's failure to close down the mine and give the US-funded protests the final word in the dispute, for example, would be cause to "leak" information regarding the true nature of Suu Kyi's rise to power and the genocidal aspirations of her political front. The predicted disillusionment of Suu Kyi's supporters worldwide will continue - those who genuinely uphold the principles of defending human rights and representative governance cannot reconcile the fact that Suu Kyi and her NLD clearly represent neither. For Myanmar's neighbors, preparations for wider persecution of the Ronhingya should be made. As the violence and injustice escalate, refugees will increase, placing a burden on neighboring states, particularly Thailand. It is important for these states to focus on the cause rather than the consequences of this predictable tragedy, and focus on the foreign-funded, hypocritical nature of the NLD regime. Failure to confront and confound Western aspirations in Myanmar will invite similar scenarios to unfold elsewhere across Southeast Asia.